This was my third trip to an East Elevation Vegan Night. I don’t think I was blogging when I went to the first two. The first visit was great, the second even better. So I was really looking forward to my third visit. Even though I don’t think the third visit was quite as good as the second, I wasn’t disappointed. This time the dishes were even more refined and creative than the last couple of visits, though perhaps a little less filling. Some were utterly brilliant, and while there were one, or possibly two I didn’t enjoy as much, others in the group were impressed. I guess it all comes down to taste. Those quibbles aside (and they are minor quibbles), this is bargain priced vegan fine dining. 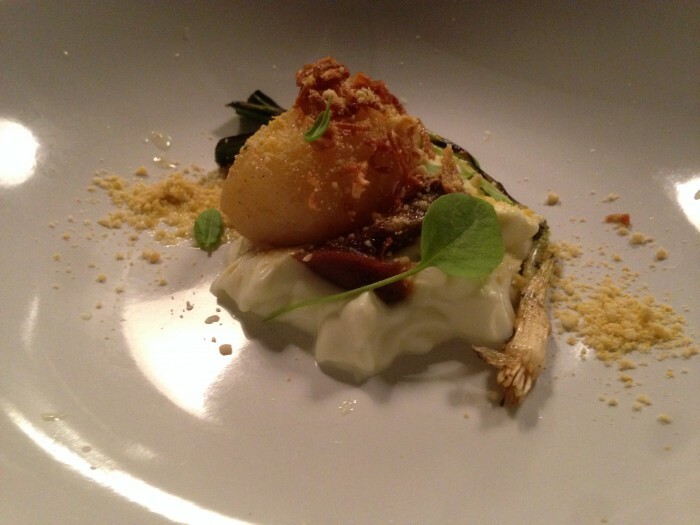 $60 for 6 courses with an optional $30 wine pairing. I love the space at East Elevation, it is open, with high ceilings and a mysterious industrial sized chocolate rolling machine in a glass room to add to the fascination. The tables are beautifully set out with flowers and herbs. This dinner also happened to be the third trip to EE of our vegan dining group. This was the site of our first dinner. Since then we’ve eaten a lot of really good food, but EE still retains a place in my heart (and stomach) as one of the best. I love that the food here is conceived as vegan, not vegetarian with something missing, as is sometimes the case. I don’t normally like jerusalem artichokes, I find their earthiness a bit overpowering, but this was brilliant and delicious. 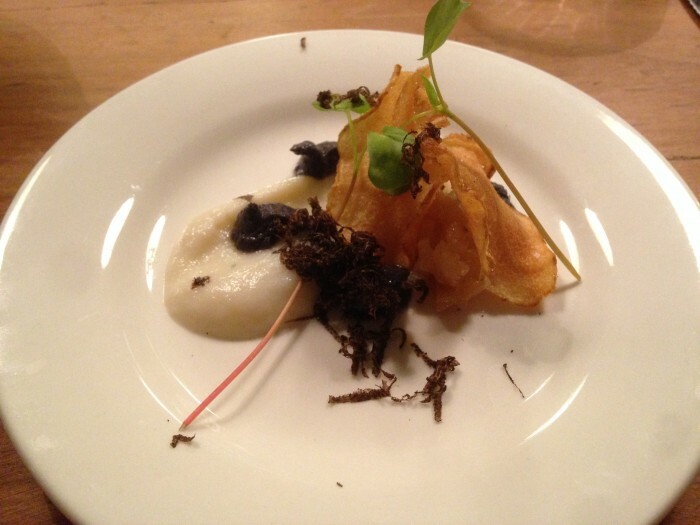 A jerusalem artichoke puree, truffles and crisp jerusalem artichoke chip. The sauce was poured at the table adding a little bit of theatre. I liked the flavours in this, but the curd was a little soft and disintegrated. I’d probably have preferred it with silken tofu to give more texture, but the flavours were good. This one was mind-blowingly wonderful. The soft potato, the crispy and caramelised onions, the smooth textured slightly tart emulsion, smoky leek and a cheesy, crunchy nut parmesan, all combined to make a great dish. Wow! I could have eaten several. Definitely dish of the night for most of us. This one left me a bit cold, others thought it was great, but I am not a big fan of carrots. 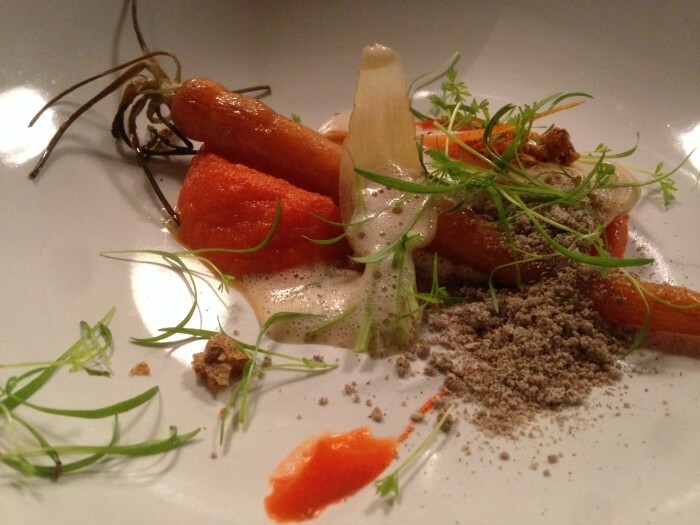 Roasted carrot, pickled carrot, carrot puree, hay flavoured emulsion of something (I wasn’t listening properly…) and a crumb of stout. 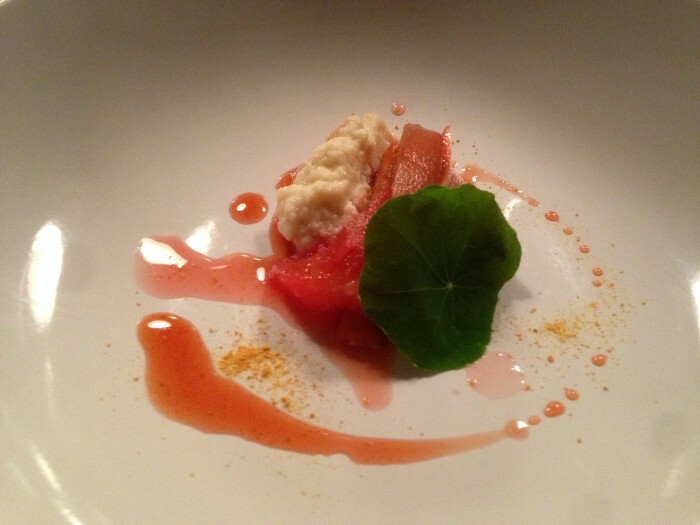 Two ways with rhubarb, poached and smoked, with an almond curd and blood orange segments and syrup. I loved the smoked rhubarb. The blandness of the almonds and the peppery flavour of the nasturtium worked well with the tart flavours of the fruits. 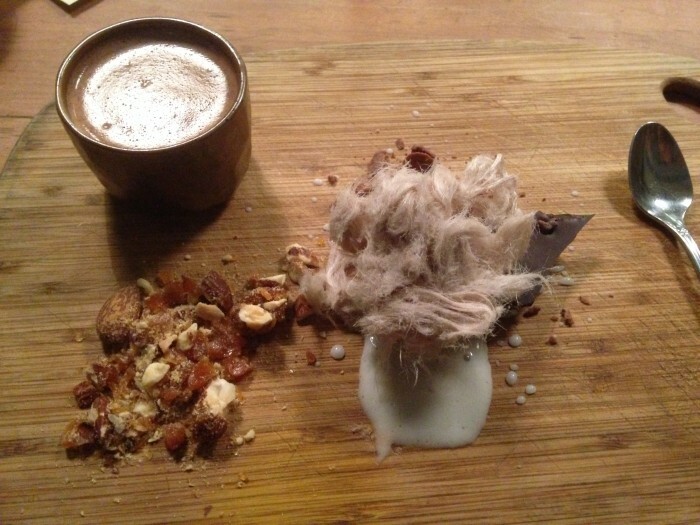 Hot chocolate, chocolate soil, almond praline, almond granita, chocolate with almonds and persian fairy floss. Yum. I’m glad to see vegan food being taken so seriously. I must keep up with things! I only ever hear about the East Elevataion vegan nights after they’ve happened. It’s a good point you make about the dishes being conceived as vegan. I’ve been to some degustations where I just get the same as everyone else with something missing. It doesn’t really encourage my fellow diners to try the vegan option. I’ve never had actual truffles – only truffle oil (which I love). 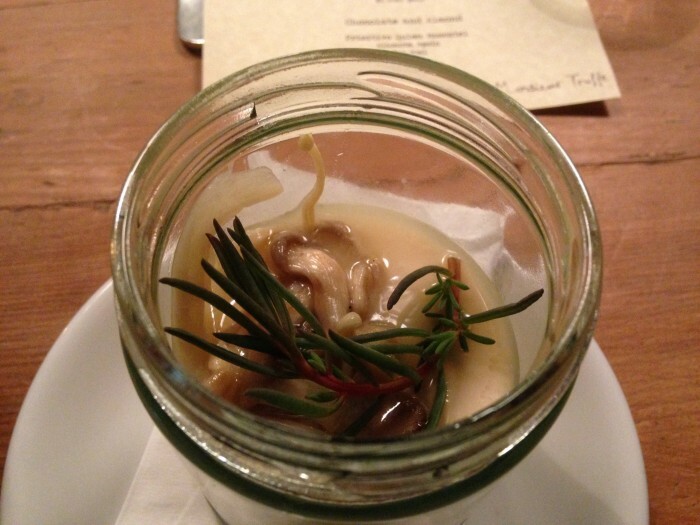 My sister’s son took her to the Truffle Festival last week – I wish I’d gone! You need to like their facebook page! I’ve been to three now and I think it is a bargain fine dining experience.